Who doesn’t like giveaways? 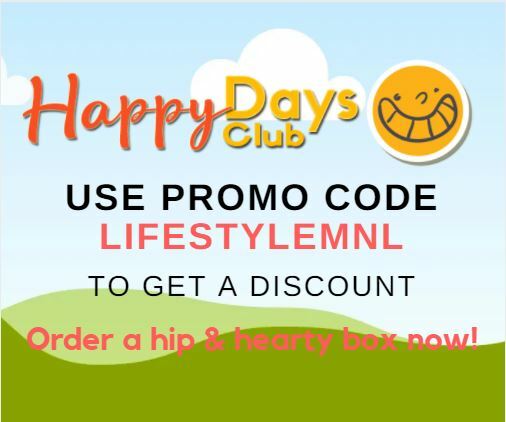 Let’s celebrate Lifestyle Manila’s first year early with a giveaway collaboration with seven bloggers from different parts of the Philippines! 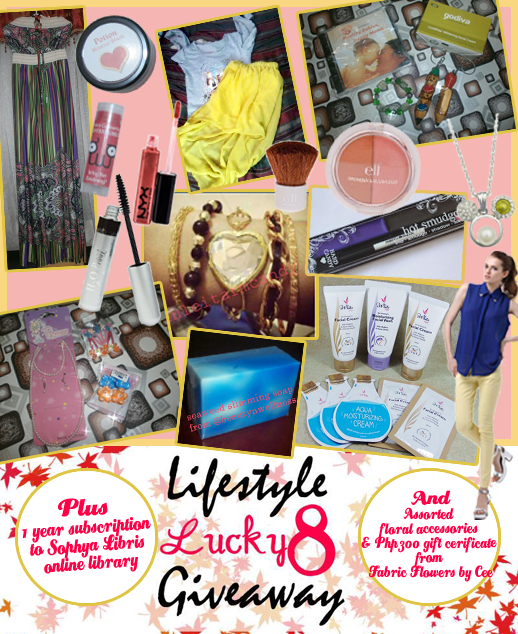 This giveaway will end on October 14, 2013 and is open for Philippine Residents ONLY. 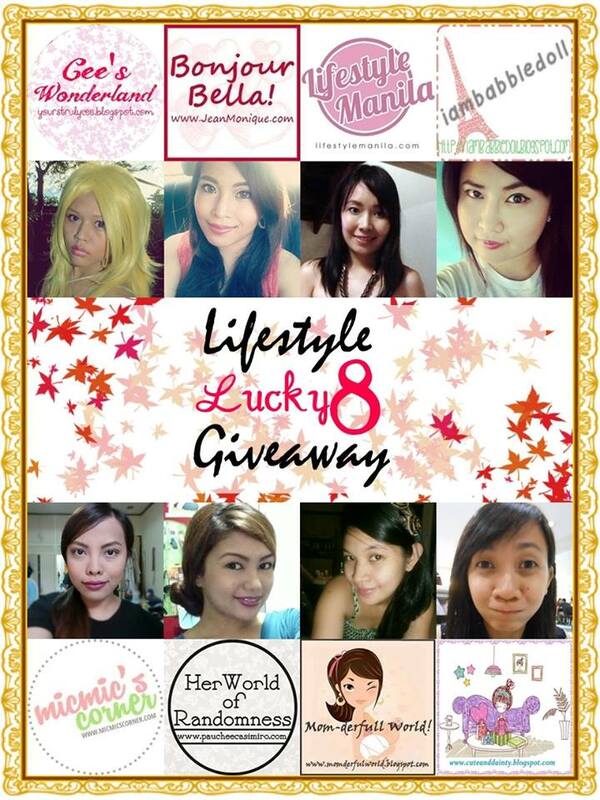 Welcome the 8 bloggers participating in this Lucky 8 Lifestyle Giveaway! Cee from Cee’s Wonderland is giving away assorted floral accessories and a gift certificate worth 300php from Fabric Flowers by Cee. Kax (me!) is giving away Potion Mineral Powder Blush (8 grams of muted berry color in a 25 gram sifter jar worth $8) and a full size Why Not Zoidberg? Intertube (bright coral nourishing lip color worth $6.50). Sort of review here. Marrien from I am Babble Doll is giving away a fashionable long sleeve top, a mustard mullet skirt, 2 Slimming Seaweed Soaps from BeautynWellness and 1 Set of Armcandy from Enleitarmcandy. Mich from Micmic’s Corner is sending out skin care products from iWhite Korea as the prize. Pauchee from Her World of Randomness is providing an ELF Bronzer and Blush Duo with Brush, a Wet N Wild H2O Proof Mascara in Brown, a Hard Candy Hot Smudge in Stunt Double, and a NYX Megashine Lip Gloss in Nutmeg from Kering Keri Store. Pearl from Mom-derfull World is providing a package for moms composed of a jumpsuit, fashion bracelet, Godiva LicoWhite Whitening Face Cream, key chains from Baguio City and a CD guide towards Motherhood, as well as a package for the kikay kid composed of Pink Pearl Accessories and Broadway Gems Hair Pieces. And last but not the least, Tet from Cute and Dainty is sending out a Mickey pendant necklace worth $11.50 and a blue chiffon blouse worth $25.99. Just follow the mechanics on the Rafflecopter gadget below. Please do all MANDATORY mechanics for your entries to be qualified/valid. They will be checked. So if you really wanna win, don’t cheat. Also, SHIPPING FEE WILL BE SHOULDERED BY WINNER. The winners will be chosen randomly via Rafflecopter. It’ll be announced on our blogs and/or our social media accounts. The winner should e-mail Pauchee Casimiro through her CONTACT FORM within 48 hours. Failure to do so will forfeit your entry. Another winner will be chosen and will also be given 48 hours. ***If a task on the Rafflecopter gadget is NOT APPLICABLE to you, PLEASE SKIP IT. If you would type anything such as “none”, “n/a”, etc. and submit it, the points allotted for that task would still be credited to you even though you did not do the task asked. This is one form of CHEATING, may it be intentional or not. So DO NOT TYPE ANYTHING ON THE VERIFICATION BOX AND SUBMIT IT if you do not have the account for the task or you did not/choose not to do it. We do these giveaways for our faithful readers and it would be unfair to those who really exerted the effort to do every single task to gain their rightful points. Thank you and Good luck!